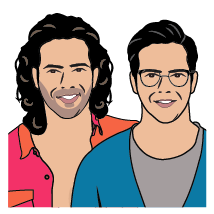 Now you can add a Judwaa 2 emoji to your tweets! Yes, Twitter and the makers of Judwaa 2 (Sajid Nadiadwala and Fox Star Studios) have joined hands to celebrate brotherhood globally! The Varun Dhawan, Jacqueline Fernandez and Taapsee Pannu starrer film unveiled a specially designed emoji by Twitter to celebrate the spirit of brotherhood across the world. The star cast of the film unveiled the Emoji at 12 noon IST as they highlighted how Judwaa 2 celebrates the story of two brothers, who despite all odds, come together and save the day. “Judwaa 2 is a story of two brothers and it celebrates brotherhood in all its fun, entertaining, quirky and hilarious avatars. The campaign aims to celebrate this spirit of love between siblings and we are delighted to partner with Twitter to rejoice this love globally through a cool Emoji featuring the iconic identical twins of Bollywood – Prem and Raja,” says Shikha Kapur, CMO, Fox Star Studios, India. ICYM… the trailer here it is again!